“Windows Explorer has stopped working” and “Windows explorer is not responding” in Windows. These are one of the most well-known problems of Windows users. Specially, Windows Explorer has stopped working error is the quite popular Windows error. People feel very annoyed with this Windows error because it doesn’t appear after taking any particular action, it appears abruptly while users are working on their Windows PC or watching movie online or playing games or surfing Internet etc. Sometimes, “Windows Explorer has stopped working” error appears infrequently and sometimes this error gets displayed repeatedly and in result you will not be able to do anything on your computer. Generally, this error is faced by Windows XP, Windows Vista, and Windows 7 operating system users. Why Do You Get “Windows Explorer has stopped working” Error? 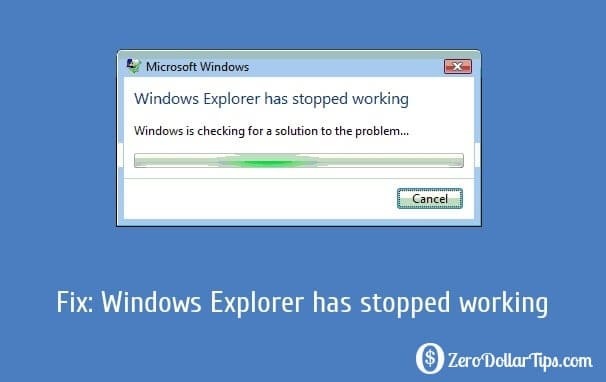 All Windows users want to know the reason behind the error “Windows Explorer has stopped working” on their PC. Possibly, you also want to know the causes of this Windows error. In most of the cases, malicious computer virus and malware programs are responsible for this error. So, whenever you face this error on your Windows PC then (first of all) quickly scan your computer using best antivirus software or anti-malware program to detect and remove virus or malware infections. Step (1): First of all, open command prompt with administrator privileges. To do so, click on Start button and type cmd in the Search box then right-click on cmd.exe and select “Run as administrator” option. Step (2): In case, you are asked to enter the password for an administrator account then type the administrator password and click on Continue. Step (3): Now at the command prompt, simply type Sfc /scannow command and then press ENTER to start the scanning. Step (4): Scanning process will take some time, so keep patient. Even, it will also repair the missing or corrupted files that are found during the scan. Step (5): It may ask you to insert the Windows CD disk if the installation CD is required to repair the issues. So, insert the Windows CD when it asks to insert. Step (1): First of all, click on Start button and then click on Computer. Step (2): Next, click Organize menu and select “Folder and search options” from the drop-down menu. 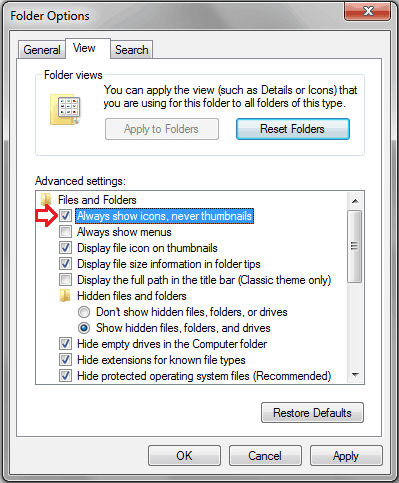 Step (3): Now on the Folder Options window, go to the View tab and select “Always show Icons, never thumbnail” option. Step (4): After that, deselect “Display file icon on thumbnails” option. Step (5): Finally, click OK to close the Folder Options window. Once you completed the above steps, go to any folders that contain images or videos and fix the corrupt images. It may help you to fix the “Windows Explorer has stopped working” error. 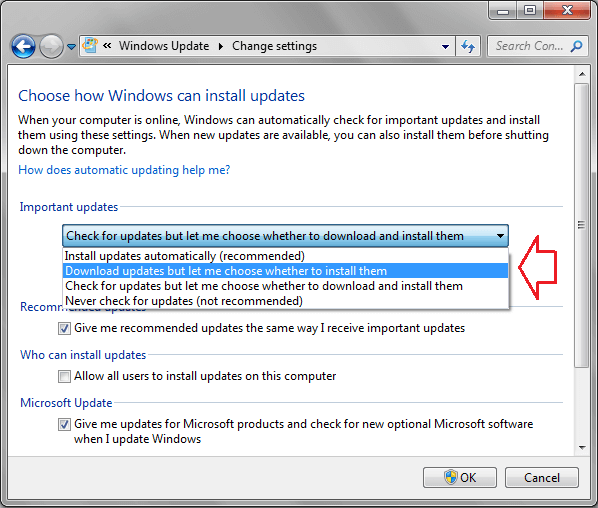 Step (1): Firstly, click on Start button and type Update in the search box and then click on Windows Update. Step (2): On the Windows update page, click on Change settings. Step (3): Now from the important updates section, select the option according to your preferences. Step (4): After that, select “Give me recommended updates the same way I receive important updates” check box which is located under the Recommended updates section. If above-mentioned methods did not help you to fix “Windows Explorer has stopped working” issue on your PC then you must understand that unwanted programs (malicious software) installed on your computer are behind this error. I am quite sure, “Windows Explorer has stopped working” error will be solved very easily after applying all these powerful methods on your Windows PC. Let us know through comment, did this guide help you to fix “Windows Explorer has stopped working” error on your Windows PC.